A view of flooded New Orleans in the aftermath of Hurricane Katrina, September 2005. It's been ten years since, and yet it left lessons that remain to be learned. It has been ten years since New Orleans was devastated by the catastrophic breakdown of its levee system, and the failure of government at all levels to protect the citizenry. 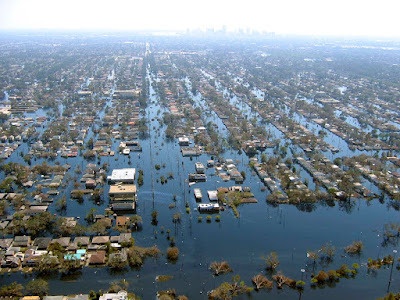 Over the past decade, locals began calling the disaster the “federal flood,” drawing a clear distinction between Hurricane Katrina and the engineering and emergency planning failures responsible for the mass death and displacement of its citizens. Even that moniker, however, is limited as an explanation because it fails to name the various local and state actors who contributed to the specific causes and scale of the disaster. After all, mayor C. Ray Nagin waited until the eleventh hour to declare a mandatory evacuation—and only after he held court with the city’s hoteliers, who feared lost profits. Ten years later, New Orleans is indeed a new city. 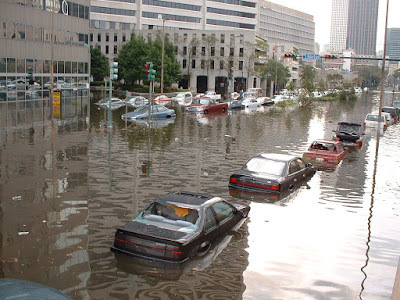 Ninety percent of its pre-Katrina population has returned. The city is whiter and wealthier. There are 97,000 fewer African Americans —a small city unto itself vanished—and yet New Orleans is majority black again. The official discourse of remembering the disaster and marking the road to recovery has come to resemble the repertoire of the city’s iconic jazz funerals. There is the slow, solemn dirge that guides the procession to the gravesite, and then the decisive moment when joyous horn blasts and an up tempo drumbeat celebrate the internment of the departed, carne vale in the truest sense of farewell to the flesh, the spirit cut free from worldly travails. 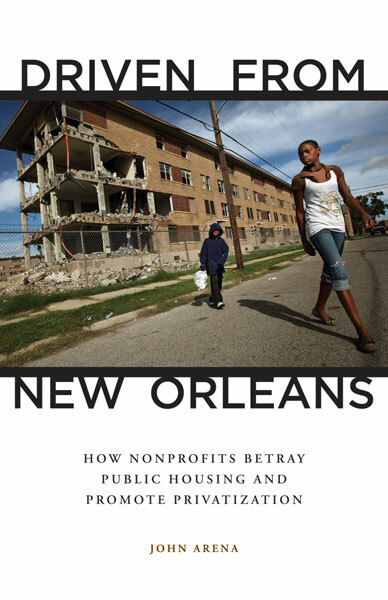 The reconstruction of New Orleans has featured the liberation of capital from market regulation, labor rights, and safety standards; the privatization of formerly public sector services like housing and education; and public incentivization of homeowner rebuilding, tourism infrastructure, film and television production, entrepreneurship, and private real estate development. City boosters, public officials, wealthy developers, private contractors, multinational hotel chains, anti-poverty researchers, entertainment conglomerates, charter school advocates, star architects, foundations, celebrity philanthropists, financiers, and grassroots activists have all trumpeted the resurrection of the city, its neoliberal experimentation in neighborhood revitalization, housing, and schooling, and expanding tourism-entertainment complex, the combination of the city’s long standing tourist economy, sports franchises and emergent film industry. Though written in different idioms and with unique concerns in mind, the swelling chorus of press statements, op-eds, and reports touting the recovery cohere ideologically. Like the contrapuntal sounds of a sousaphone’s bass line, and cascading horn improvisations that add depth and verve to the same melody, a steady parade of mainstream commentators have helped to secure the neoliberal recovery project’s hegemony. Their anthems are mostly written in the key of resiliency. Kristen McQueary’s tone-deaf Chicago Tribune piece, “In Chicago, Wishing for a Hurricane Katrina,” where she mused that a comparable crisis might create the opportunity for pro-market reforms, was rightfully denounced from New Orleans to Chicago and beyond. Many others who are better informed and more tactful than McQueary have seized upon the story of the city’s recovery to advance the same ideological project, with greater effect. I disagree with most of what Gladwell and McQueary have to say. They endorse the same tabula rasa rhetoric and scorched earth policy touted by elites during the weeks when New Orleans was still filled with brackish water, and the dead were still being identified. James Reiss, chairman of the Regional Transit Authority, expressed the emerging elite consensus when he said, “Those who want to see this city rebuilt want to see it done in a completely different way, demographically, geographically, and politically.” Others, like restaurateur Finis Shellnut, Louisiana Congressman Richard Baker, and deposed city councilman Oliver Thomas, made even more strident demands to rid the city of the poor, the unemployed, and public housing tenants—“the soap opera watchers,” in Thomas’s words. Gladwell’s account of privatization’s virtues lifts those ideas out of this political context, and their connection to actual, class interests operating on the ground disappears. Gladwell, McQueary, and other champions of the market-driven recovery paper over its violence, and neglect the interests of those who bear the heaviest burden of the “necessary and painful sacrifice” of neoliberal rollback. Gladwell never mentions the current affordable housing crisis in New Orleans, where many spend 41 percent of their monthly wages on rent. Hiding behind clever storytelling and cherry-picked social science findings, Gladwell’s words justify a ruling class project that has produced mass layoffs of public employees; mass firings of middle class, unionized teachers (many of whom were African American women); the eviction and resegregation of public housing residents; the hyperexploitation of undocumented, mostly Latino and male construction laborers; and the reconstitution of a low-wage servant class of formal and informal workers who produce the phantasm of New Orleans for millions of visitors every year. In his now classic work on gentrification, the late geographer Neil Smith used the term “revanchist city”—derived from the French word for "revenge"—to describe the broader process and political impetus of neoliberal urbanization. In the closing decades of the twentieth century, Reagan Republicans and New Democrats organized in succession to dismantle the New Deal social compact and restore capital’s power over living labor, with the urban built environment, infrastructure, and governing institutions reorganized to better facilitate consumption, profit-making and capital flows. The renewal of this revanchist project in New Orleans over the past decade is distinguished only by its rapidity and perhaps by the dearth of opposition. Some see anti-racist organizing as a way of opposing the neoliberal recovery-growth regime in New Orleans, but this approach is inadequate as social analysis and as politics. Rapper Kanye West may have offered the most memorable statement of this sensibility when he went off-script during a live telethon for Katrina survivors. “America is set up to help the poor, the black people, the less well-off, as slow as possible,” West said, before punctuating his impromptu speech with the charge that “George Bush doesn’t care about black people.” His conviction, that racism was the primary motive for the death and misery in New Orleans, has been rearticulated and expanded in a small library of books and essays over the past decade. The Nation columnist Mychal Denzel Smith even claims that for his cohort of black millennials, West’s words were “our first relatable expression of black rage on a national stage” that has since inspired resurgent waves of black political activity from the election of Barack Obama to the anti-police brutality protests in Ferguson and Baltimore. Given the media optics of the Katrina crisis, where thousands of black residents crowded the Superdome in search of relief, it is not surprising that so many concluded the disaster was caused by institutional racism and systematic discrimination in education, housing, and jobs. The racial justice frame, however, does not discern class contradictions within the black population, and the variegated experiences of recovery. This framing fails to capture how the contra-flow evacuation process worked effectively for middle-class blacks with access to cars, as it had for whites of similar means. The property owner-centered reconstruction programs supported by city, state, and federal governments also helped middle class homeowners, black and white, to restore their homes and lives, while the same governing coalition pushed a wave of evictions and public housing demolitions that created hardship for black working class residents, and made it more difficult for them to return. Anti-racist politics is a weak counter to the official line of pro-market recovery. At best, liberal anti-racists constitute a second line, that group of revelers who trail the brass band. In a street parade, the second line may be formal or spontaneous, but their role is always auxiliary, their shouts and energy supporting and enhancing the power of the first line. The right of return emerged as a popular slogan and demand against the designs of city elites who wanted to “right size” New Orleans by banning reconstruction in the city’s lower lying, and in most cases, black neighborhoods. Some argued that New Orleans’ cultural distinctiveness would be lost if blacks were not allowed to rebuild those neighborhoods where the sounds of Professor Longhair, Fats Domino, the Meters, Irma Thomas, Rebirth Brass Band, Katey Red, and so many others were born. Anchoring the right of return demand in relative cultural contributions rather than the right to housing, however, helped to shift public debate to familiar themes of racial diversity and recognition. Such concerns were vital to the revival of the city’s tourism industry, where place branding and authenticity form crucial linchpins uniting big real estate developers and Mardi Gras Indians alike. Those who care about social justice need to strike up a new band, one that places the interests of the Crescent City’s dispossessed and laboring classes in the main line, and call a new tune, one that lays bare the fundamental political-economic forces producing inequality in New Orleans and other cities across the country. Otherwise, we will be left with the same ensemble of powerful investor class interests, their think tanks, foundations and second liners. And we know they are marching down a dead-end street. 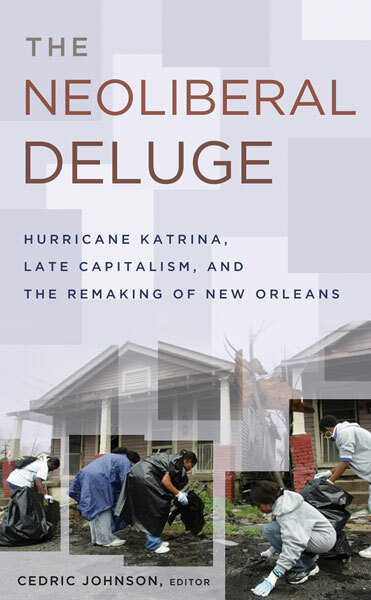 Cedric Johnson is editor of the essay collection The Neoliberal Deluge: Hurricane Katrina, Late Capitalism, and the Remaking of New Orleans and author of Revolutionaries to Race Leaders: Black Power and the Making of African American Politics. He is associate professor of African American studies and political science at the University of Illinois at Chicago. between those who have access to crossing them, and those who do not. Asad, a Somali merchant who runs a corner shop (spaza) in an informal settlement in South Africa, expresses the fear intrinsic in his search for a livelihood here, where the history of apartheid has produced a segregated and stratified society. In the United States, we recently heard similar comments from U.S. presidential candidate Donald Trump, who characterized migrants as rapists and criminals. However, in the U.S. and South Africa, one could argue that many migrants have more to fear from native-born citizens, border security, and law enforcement agencies in contexts where racial, religious, and xenophobic violence and exploitation persist. Anti-migrant rhetoric is not exclusive to the United States, as it has also been increasing in western Europe, with stricter immigration policies resulting in what some are calling ‘Fortress Europe.’ But migrants and refugees continue to resist the fences erected by the wealthiest nations in the world in their desperate search for physical, economic, and emotional security. International Organization for Migration reported that in the first five months of 2015, 45,000 migrants were rescued in the Mediterranean Sea, traveling on rickety boats controlled by ruthless smugglers who charge thousands of dollars while subjecting them to inhumane treatment. This is the inevitable consequence of increasing restrictions to legal migration. In taking such risks, however, thousands of migrants never make it to the other side of the Sea (or the treacherous routes in the Americas, Middle East, and elsewhere), remaining faceless and nameless. Migrants traveling from North Africa (Libya, mostly) are diverse but are dominated by those originating from the Horn of Africa (Eritrea, Ethiopia, and Somalia), and war-torn Middle Eastern countries such as Syria and Iraq. Citizens from these nations continue to confront tremendous physical, economic, and psychological stress as a result of protracted wars or repressive, corrupt, and brutal regimes. Thus, thousands of these migrants risk their lives for a chance to gain a foothold in the Western hemisphere, which is imagined to provide social, economic, and political rights. 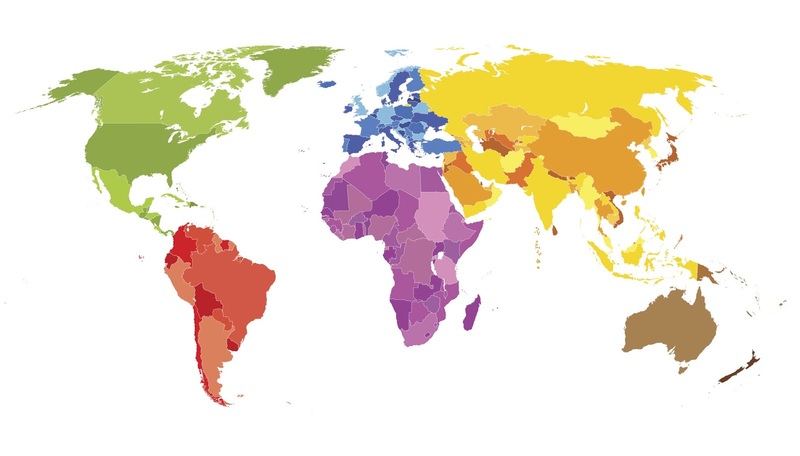 Looking at the Global Mobility Index can help us better understand why these migrants are so desperate to accept the high risks that migration entails. Passports from Afghanistan, Iraq, and Somalia have the fewest visa exemptions in the world. This is to say that citizens of these countries are least likely to be given a visa for travel and face the most obstacles to cross borders legally. It is no coincidence that these are three Muslim nations where the politics of the post-9/11 war on terror remain entrenched. Those privileged to live in the most prosperous regions of the world enjoy what the scholar Aihwa Ong has termed flexible citizenship. Those carrying Western passports who can afford to travel live in a borderless world, as their passports rarely require visas. The elite from non-Western nations also access this flexible citizenship through their wealth, where they garner Western citizenship through financial investment in exchange for legal residency papers and eventual citizenship. But for millions of would-be immigrants like Somalis, Iraqis, and Afghanis who lack the financial capital to purchase such flexible citizenship, borders remain concrete and forbidding. Though migration can never be reduced to simple push-pull factors between origin and destination, it is important to underscore that migrants are agents whose decision-making processes are shaped by and also shape global politics. The expansion and contraction of borders intrinsic in globalization affects their lives. The decision to cross borders by any means necessary represents a response to these political and economic processes. Global processes also shape migrant identities, which can become assets or barriers depending on the policies and dominant patterns in the place of settlement. The multifaceted experiences and lives of migrants defies their monolithic portrayal as faceless and nameless, yet posing an existential threat to wealthy nations. Fences, whether physical, religious, or racial, damage everyone—natives, migrants, and would-be migrants—and rarely succeed in their intention, though they make migrant lives very difficult. 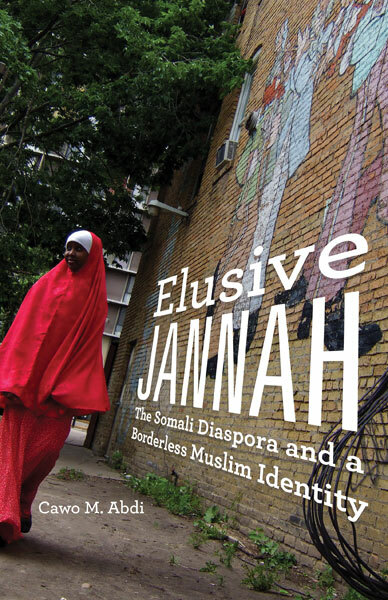 Cawo Abdi is author of Elusive Jannah: The Somali Diaspora and a Borderless Muslim Identity. Abdi is associate professor of sociology at the University of Minnesota and a research associate in sociology at the University of Pretoria, South Africa. "This is a powerful and beautiful ethnography of members of the Somali Diaspora dealing with the opportunities and disadvantages of life in three points of settlement. Cawo M. Abdi gets very close to the subjects and depicts their outlooks, strategies, and trials in a convincing and rich manner." "Elusive Jannah provides a fascinating window into the identities, strategies, and struggles of Somalis in three very different national contexts. Based on ethnographic research in the United States, South Africa, and the United Arab Emirates, this is an engaging, well-written, and welcome addition to the comparative study of international migration. 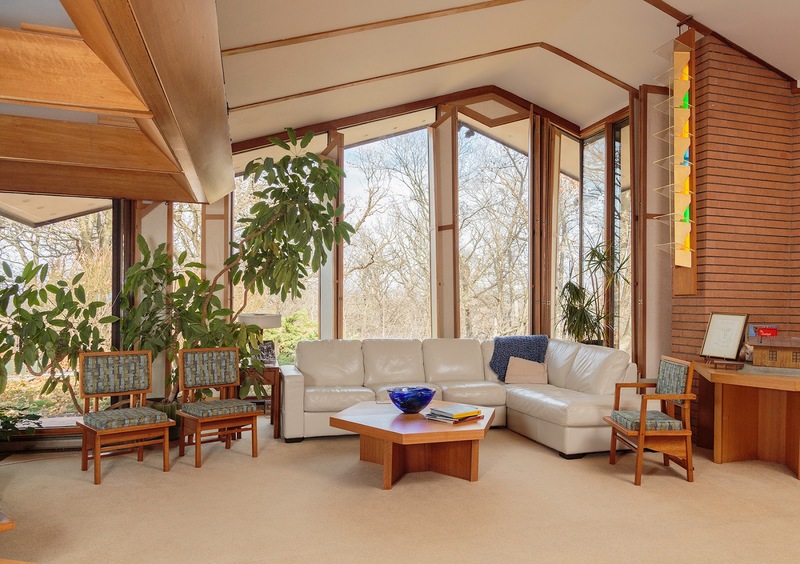 Did John H. Howe design any Frank Lloyd Wright houses? Howe in fact designed any constructions attributed to Wright. Image credit: William Byrne Olexy, courtesy of Modern House Productions. At 19 years old, the architect John H. Howe became a founding member of Frank Lloyd Wright's Taliesin Fellowship—a group of 23 apprentices that lived with the famed architect at his estate near Spring Green, Wisconsin. Howe earned a reputation as "the pencil in Wright's hand," and as such it's no surprise that speculation has spread over whether Howe designed any structures traditionally attributed to Wright. This is a provocative question that dogged Jane King Hession and me as we researched Howe's architectural career, first at Wright's side at Taliesin for more than a quarter century and eventually on his own for another quarter of a century. If only it were an easy one for us to answer! One of our goals in researching our book was to illuminate Howe's role at Taliesin. Certain questions had to be addressed. How did Howe assist Wright? How were projects designed, developed, and presented? Who did what on which projects? How were these beautiful drawings made? What was the working method? Howe was direct in answering the questions in interviews late in his life, insisting he never designed anything during the Taliesin Fellowship, for designs were Wright's exclusive arena. Instead, he maintained, all he did was translate Wright's initial schematic designs into more developed drawings. From these more mature drawings, working drawings (the "blueprints" from which builders build) followed, with Wright fully engaged at all stages. Howe went so far as to correct an interviewer who assumed Wright was a feeble presence in the studio in the final years by insisting that Wright was fully engaged to the end. We have wondered if Howe was merely continuing to be the "consummate apprentice," as he was known, when he asserts that all the creative work was Wright's. Was Howe overly modest? Was he fearful of the wrath of Wright's widow, Olgivanna Lloyd Wright, with whom he had notoriously difficult relations? Whatever the case, even Howe's widow, Lu Sparks Howe, maintained the "party line" that her husband had no part in designing anything during Wright's lifetime. So, few insights came from either of the Howes. Nevertheless, rumors have long persisted about who might have really designed any number of houses from the 1950s. The rumors started with assertions by former Taliesin apprentices who worked in the drafting studios at that time. 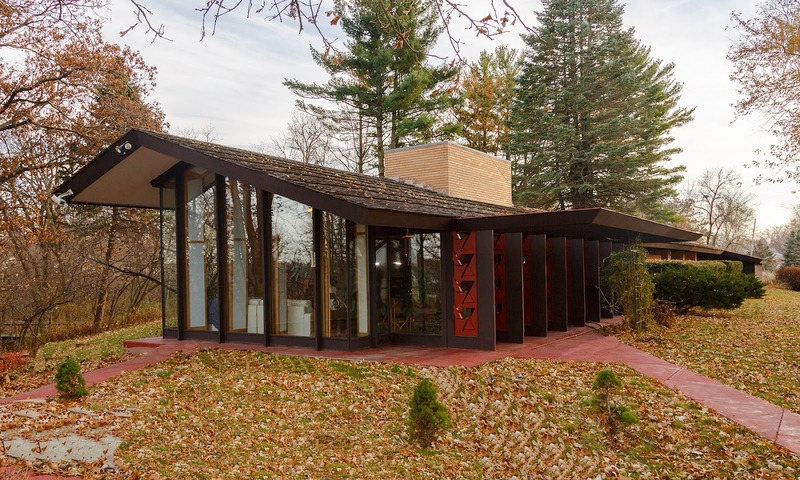 Houses mentioned include the Charles F. Glore House in Lake Forest, Illinois (1951) and the Paul Olfelt House in St. Louis Park, Minnesota (1958), both of which display a similar lightness to an executed Howe design (Bryant and Marjorie Denniston House, Newton, Iowa (1958)) with their vaulted roofs seeming to float above delicate window walls. Can these rumors be substantiated? We have not found direct evidence, though we have not pored over the drawing files, either (which are now archived at the Avery Architectural Library at Columbia University in New York). Examination of these should shed light on how the design came about—and whether those initial sketches are in Wright's hand or not. and delicate floor-to-ceiling glass wall. The topic of how Wright's Usonian houses came into being is addressed by former Taliesin apprentice Curtis Bessinger in his book, Working with Mr. Wright. Bessinger indicates one method was for Howe and Wright to confer about which previous project might be adapted as a starting point for the new design. Often Howe or another senior apprentice would take the lead in creating the new design. Specifically, Bessinger mentions the creation of the Howard and Helen Anthony House in Benton Harbor, Michigan (1949), which he adapted from an earlier Wright cottage scheme. These adaptations came naturally to senior apprentices, who were intimately versed in the Wrightian compositional vocabulary and building grammar. Though architectural designs and completed buildings are often presented in the press as the heroic creation of a single genius, the reality of architectural production is one of diligent work by an integrated team. That was certainly true at Wright's Taliesin studios. By Wright's death in 1959, Howe oversaw a studio of 25 individuals that were working on a similar number of projects. What is undeniable is that architecture is the byproduct of intense collaboration between many contributing entities. My own experience as a practicing architect bears this out. On some past projects, I was clearly the lead designer; on others, I delegated the task to another. An additional category exists, too, where it is difficult to pin down who did what, with the fluidity of the design and the collaborative process. Thus, attribution is shared or has to be more nuanced. It is not difficult to imagine similar occurrences in the drafting studios at Taliesin. I suspect the sharing of design responsibility, if it occurred at Taliesin, was similar to the sharing I've mentioned in my career: a product of the pressure of time to get new projects moving in the midst of the other workload. In short, it was expedient. The 1950s (which Wright entered at the age of 82) were an incredibly busy time for Wright. 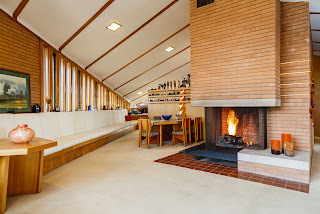 He was involved with several major projects (among them, Price Tower in Oklahoma, the Guggenheim Museum in New York, Marin County Civic Center in California, and Plan for Great Baghdad), travel between three residences and abroad, and writing competed with the Usonian houses. Sharing some of that load seems plausible. Howe employed a number of strategies to keep the workflow moving expeditiously. He tried to schedule review sessions for finished projects at times when other engagements forced them to be short. He even revealed to a later client that he had mastered Wright's initialing of red square signature blocks, which signified his approval. How often, if ever, he may have bypassed Wright is unknown. On one occasion, Wright asked the apprentices to design textile block houses for the box projects (design activities demonstrating apprentices' creative abilities), for Wright envisioned them as a promising solution to the housing crisis facing America immediately after World War II. Did any of these apprentice designs become Usonian Automatics, or the seeds of them? Or was Howe's birthday box projects of 1949 (presented to Wright on his 80th birthday), which impressed Wright greatly, a progenitor of these? Further investigation is needed, to be sure. This sort of focus on a common design topic is a frequent feature of many an architecture school studio curriculum, past and present. On the whole, my research with Jane King Hession has been inconclusive in regard to Howe or any other apprentices designing outright Frank Lloyd Wright houses, or other structures for that matter. It makes for intriguing speculation, though. In all likelihood, it may have happened. Clearly, more research needs to be done to arrive at a more definitive answer. Knowing how architectural offices work, it would be naive to automatically assume it did not happen, even in a studio environment with a single undisputed master. 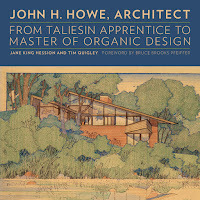 Tim Quigley, AIA, and Jane King Hession are co-authors of John H. Howe, Architect: From Taliesin Apprentice to Master of Organic Design. Quigley is principal of Quigley Architects and taught architectural studio and history courses for twenty years at the University of Minnesota and Ball State University. 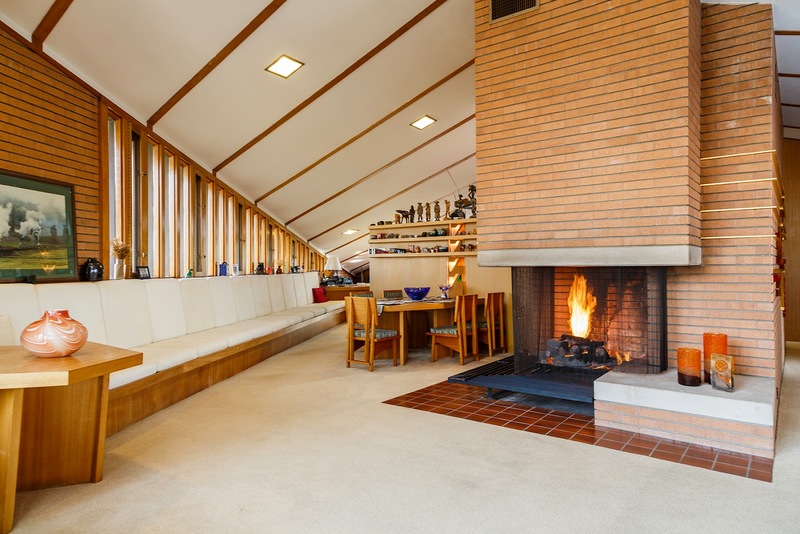 He is a former president of the Frank Lloyd Wright Building Conservancy, vice president of the Minnesota chapter of Docomomo, and president of the advisory board of the Goldstein Museum of Design at the University of Minnesota. Hession, an architectural historian and curator specializing in modernism, is a founding partner of Modern House Productions; coauthor of Frank Lloyd Wright in New York: The Plaza Years, 1954-1959 and Ralph Rapson: Sixty Years of Modern Design; and a former president of the Frank Lloyd Wright Building Conservancy. "A first-rate and engaging story. 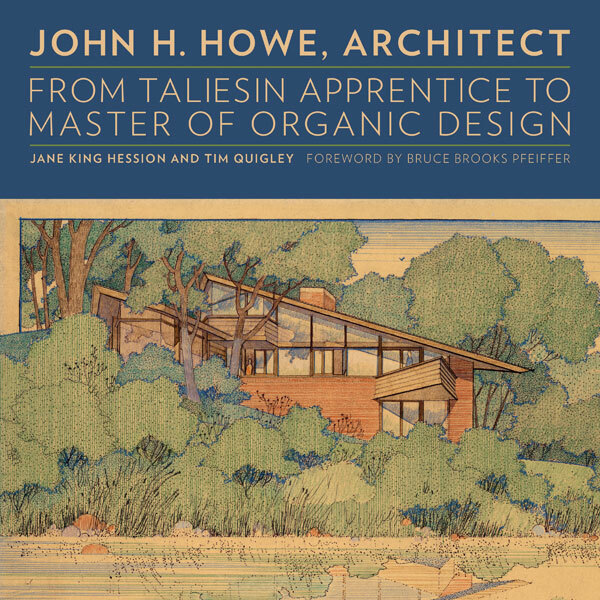 This book not only brings attention to the legacy of organic architecture as embodied in John H. Howe’s work, but also reinvigorates the discussion of creating buildings in harmony with the nature of our planet."